Have you recently cleaned up your diet? Many people have turned from their former SAD (Standard America Diet) ways andare now looking to cleaner, healthier options for their meals. While it can seem overwhelming at times to make such a change to your eating habits, eating cleaner doesn’t have to be difficult. Even if you’re an active person looking to gain muscle, a vegetarian looking to eat a balanced diet, or a person trying to lose those last five pounds, eating cleaner and using clean supplements and protein powders can help you reach your goals, whatever they may be. 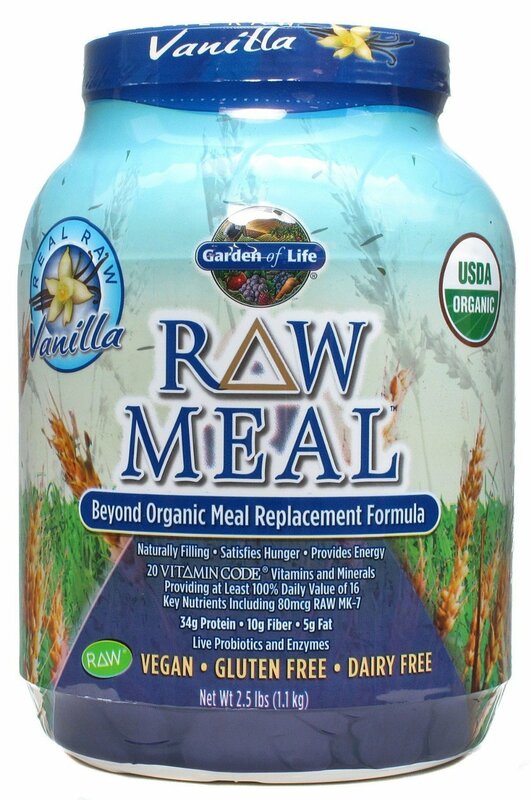 A great option as a supplement, meal replacement, and protein podwer for women is Garden of Life’s Raw Meal powder. 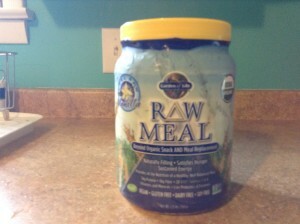 Raw Meal is billed as a “Beyond organic snack and meal replacement,” and it also contains enough protein per serving to be considered a protein powder for women as well. This product is perfect for anyone needing to use a protein powder that includes natural ingredients, lots of protein per scoop, and types of protein other than whey. Raw meal is not your typical protein powder, which means some things about it are quite different from other protein powders you may have tried before. 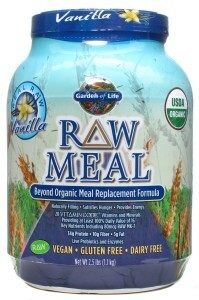 Raw Meal is a meal replacement product, so it contains other ingredients to help fill you up and keep you energiezed. Because of the extra ingredients, this powder has a different taste than other powders; it features a very raw, natural taste in the “real raw vanilla” flavor. 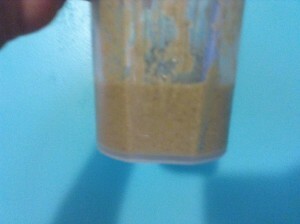 The product is also more grainy and thick than other protein powders for women. Our taste testers noticed that it had a gelatinous texture to it, and this thicker texture lead to our testers feeling fuller longer than other types of protein powders. 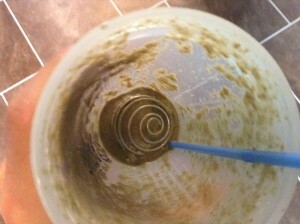 It has a plain vanilla flavor, making it a good bet to use mixed into a smoothie or recipe with other whole, clean foods. Because Raw Meal is a meal replacement type of protein powder, it is full of awesome nutrients and benefits to help your body aciehve whatever goals you may have for it. Wanting to build lean muscle? Wanting to lose some weight? Aiming to better your diet or supplement? Raw Meal has you covered on all of these fronts ad more. By comsuming two scoops of raw meal as a meal replacement, you receive 34 grams of protein; this protein is vegan and vegetarian friendly, as it comes from RAW’s certified organic plant protein blend, which is a blend of various grain, seed, and legume proteins- no dairy or soy ingredients here. Drinking or eating the two-scoop amount also allows you 100% of your RDA for many added vitamins and minerals, from vitamin D to vitamin C and many of your B vitamins as well, all essential for women. The serving gives you all of these benefits for only 310 calories for the two scoops, which means if you are trying to use this to lose weight, you’re getting a lot of nutrition for a very small amount of calories. RAW meal also adds a fiber blend, antioxidant blend, and probiotic blend to their product, allowing for a whole gamut of nutritional advantages. Raw meal offers all of these great benefits without any added artificial ingredients, GMO’s (genetically modified orgamisms) or gluten, lactose, dairy and soy. This vegan product is certified organic, and does no contain any pea protein. This means youre getting a whole lot of goodness in one canister to make your body a happy place, without any junk. Vegans and vegetarians looking to get more protein will find raw meal to be a great supplement to their meals to build their protein amounts without sacrificing their beliefs and ideals. From a price perspective, Raw Meal is about $0.88 per ounce making it pretty affordable. If you take one scoop servings you will get 14 serving out of each 1.23 pound container. How about we look at some pros and cons of Raw Meal by Garden of Life? If you are committed to clean eating or eat an exclusively vegan diet then Raw Meal could be a nice supplement to help you get more protein in your diet. We really like all the different minerals and vitamins that are included in this powder. Serious strength trainers who want to build muscle will probably find this product’s protein yield underwhelming with a taste that is less palatable than whey based protein powders with extra sweeteners.